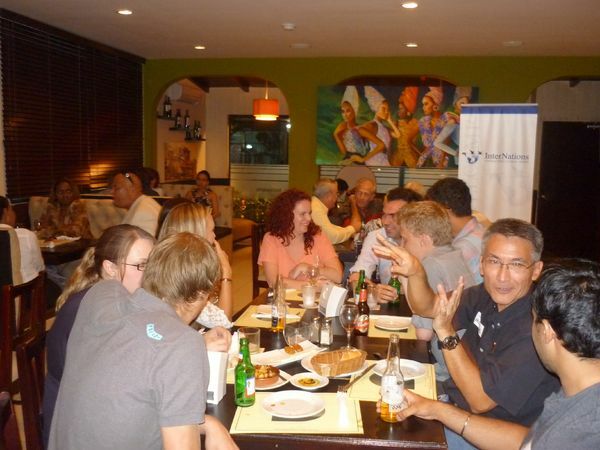 It’s Expat Dinner Time in Panama! Before this internship, I’d never gone to another country for a period of time longer than two weeks. I’d also never gone to a foreign country alone! I did a lot of research, and I got a lot of advice. The piece of advice I received most often, especially because my office would be small (only two people plus me), is to meet people! Sign up for groups, sign up for clubs, and go to events! Lo and behold, a month goes by and I get a notice saying that the Panama Community is hosting a dinner! Oh man, was I excited!!! But I was nervous. Who were these people that I was going to meet? I had no idea what to expect. In part because I was so early, and in part because I’m naturally kind of awkward, I spend the first hour or so on my own, admiring the amazing (it really was!) artwork that was all over the restaurant. As soon as the bar opened I grabbed a drink, and looking less awkward, started cautiously approaching people who didn’t look too involved in their conversations. I’m pretty sure I was still super awkward, though. First thing I appreciated: they all spoke English! Travelling to a country where even in the business center English is uncommon makes you appreciate how many people coming to Canada learn English so quickly! Needless to say my Spanish is coming along, but much…much slower. Best thing ever: I met an American who has lived the majority of his life in Panama working for the Panama Canal Authority, and he spoke only marginally better Spanish than me! In the Canal, he explained, since it was all-American up until the year 2000, there was no need to learn. Now, with the Canal being controlled by Panamanians, there’s more of a need, but he understands and speaks Spanish just enough that to become fluent is just not something that he feels an overwhelming need for. 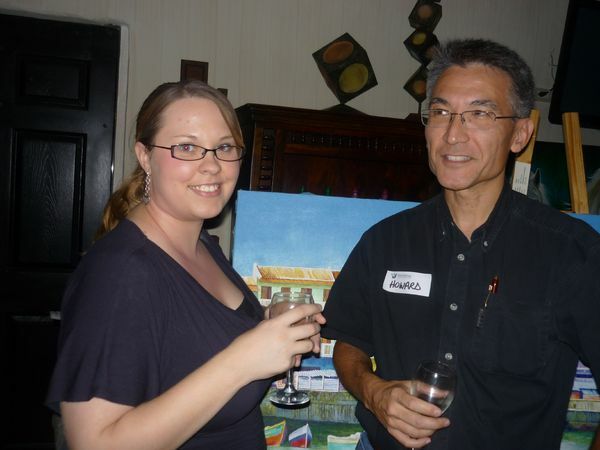 Me and Howard, both not so savvy Spanish speakers. With my ticket for the dinner I got two fancy drinks and some great deals on Tapas! A very Latino food, and my first experience here in Panama with it. So delicious! Splitting the food and the bill with two others, I enjoyed bite-sized pieced of fried tuna, bread dipped in balsamic vinegar and olive oil, Spanish omelet (the potato kind), and some cut up pieces of octopus! Deliciousness! Group shot sneak attack! Enjoying friends, food, and good conversation. The night wound down at around 11:30, and I was walked home (since the restaurant was only about ten blocks from my apartment) by some of my newly-met expat compatriots. In speaking with the organizers, they informed me that they hold these get-togethers once a month, normally every third Thursday. That will make the date of the next dinner in Panama August 16th. Perfect! Two weeks before I leave. It’ll be a ‘Buen Viaje for Mara’ Party, and I’ll be able to see some of the wonderful people I met here before heading back across the continent. I’m looking forward to it! 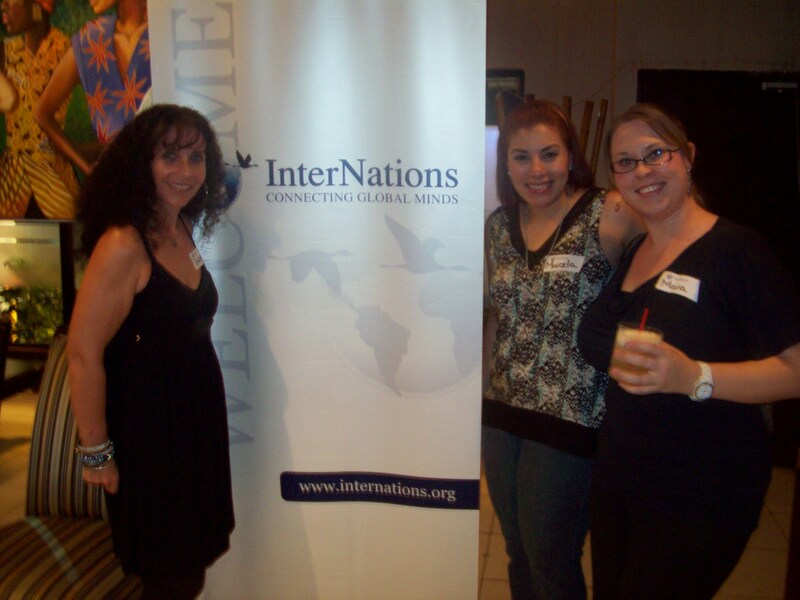 Myself and the two hosts of the InterNations Panama Event.. Canadians!